It starts with ‘Tsunamiyin Binaamiyae. . ‘. You know where this is heading. This is an all out spoof on top stars. Director CS Amudhan and Chandru are the stars of this song. While the track gives out a very funny parody flavour, if you just go beyond a little- you get creeped how serious this stuff is actually. And that’s what is exceptional humour. Speaking about the music itself, there is a lot of electric guitar zaps that sometimes comes off as jarring to listen. But this song will win with its lines. Vaa Vaa Kaama picks up gradually and sets a comfortable pace. It doesn’t want to try hard. It likes to stay in its comfort zone of ‘good music’,and a bit sensual in its lines. But one thing to note is the ‘lewd’ is not so crass after all in the track but retains the feel. There is also play of a solo guitar in the middle interlude that serves as a respite from the song’s mono-feel. Touting sensuality with lightness is the song’s pro and comes highly listenable. Okay, what was that first word in the track? Really. Let’s listen up again. And again. Okay it’s ‘Kalavarame’. It’s going to be a motif in the entire song. Some may like it. Otherwise, the song is a wonderful melody that deserves a definite spot in the playlist. Chinmayee’s rendition is as mesmerising as ever. Madhan Karky’s lyrics also help elevate the song’s life up notches. Handling of instrumentation, like the little violin portions are things which might make you listen to this track in ‘loop’ mode. Oh and Chinmayee’s gibberish is just so cute as it would require skill to pull it off. A serious start layered with string music stretches into drum beats and falls low suddenly to only give a respite and again rises high with vocals. Carnatic instruments begin to dominate as we hear a wonderful male vocal rendition. We may not know if En Nadanam is taken seriously in film (memories from first part haunt us), but this song on a musical level is almost ‘perfecto’, you can say. We aren't even shocked, we expected it ; kind of wanted it too after the 'Oh maha zeeya' from the first edition of 'Tamil Padam'. Taking the infamous 'Evandi Una Pethaan' from 'Vaanam' and 'Adida avala, othada avala' lines from 'Mayakkam Enna' to be its lyrical motifs, the track attempts to create a humourous/sensible mock out of it. And one must agree it does to a larger extent. Keys and Nadaswaram junctures punctuate and let the song sway and retract in its pace. After a while, the track gets laboriously mild paced, but is helped by its lyrics to make one attentive and enjoy it as well. It is one part a lament/reprimand on men and another, could be considered an amusing anti-men anthem(unfortunately holds true in many circumstances). For all its mockery and spoof quotient of famous songs,the track altogether cannot be taken lightly as well. There is that end 'enge irundhaalum nee nalla iruda' part which defines the feminine nature of forgiveness and empathy. Playlist worthy. With a fitting release on women's day, don’t even bother to listen if you’re a man who gets easily offended. This is a song just over two minutes in duration. But Jithin, Sowmya and the guitarist have dished out an experience that can’t be just taken in a single hearing. Chella Penney really accentuates what the composer is capable of. It’s simple in tone, rustic in accompaniment. We couldn’t have asked for a better track in the album. Short of a minute, this is a fiery praise touting song for Shiva. We can expect it at heroic mass moments in the film. And it really tries very hard and gives justice as well. Sure, talk about the excitement wanting see Shiva flaunt to this track on the big screen. . . Supporting itself with a devotional touch and armed with comic lines, Phoenix Paravai is a serious amp up of heroism. "Suriyanai kandu naai kuraithaalum kadika ninaithaalum athu nadakaathu"- lines like these remind us why we adore Shiva. And the lyricist have taken effort to spew lines of fire that would justify the 'parody' mass actor. 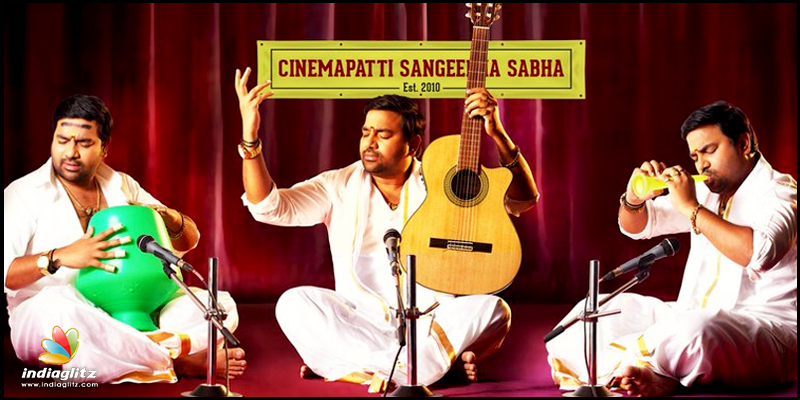 Aatharamaanai is a melancholic conversation between the singer and a sad cello. Thiyaru’s lines are moving as is the short track. It doesn’t lack in melody as well. Thilaka’s voice is emotionally rich in Aatharamaanai which gives the track a powerful dynamic even with the most minimalist set up. One word : moving. Verdict: An album catered to the film’s nature, it also has tracks that are singularly impressive.